Winemaker - Jaffe Estate - Napa Valley estate-grown Cabernet Sauvignon, Metamorphosis, and proprietary blend, Transformation. Gary and Pam Jaffe had never heard of David DeSante when they found themselves singling out his wine over and over again in a blind tasting. They didn’t know about the range of experience David brought with him to the table, or that he shares their zeal for family togetherness. They just knew he was making some exceptional wines. The Jaffes have since learned that a life-altering decision put David on the course that led him to Jaffe Estate. Midway through medical school, he was emboldened to pursue what he had come to believe was his true calling. He left Virginia for California, enrolled in the Viticulture and Enology program at UC Davis and earned his master’s degree. Robert Mondavi Winery hired him to do grape variety clonal research. He traveled and worked the harvest in Australia’s Margaret River region. 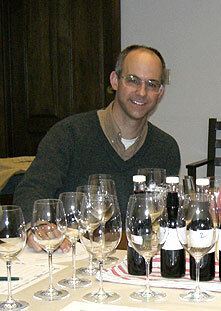 He returned to Napa Valley and became winemaker at S. Anderson Vineyards, where he spent three years honing his skills. He expanded the red wine program at the vineyard--known up to that point primarily for its sparkling wines--crafting textured, age-worthy Cabernets. David now produces wine under his own label, as well as serving as winemaker for several small Napa brands. What he enjoys most about his work at Jaffe Estate is the opportunity to make elegant wines from grapes grown and vinified in the classic Napa Valley style. The vineyard structure and deft balance of the resulting wines would be immediately familiar to the great winemakers of the 1970s who brought the world’s attention--and respect--to Californian wines.